Pureshield Impex Private Limited - Exporter of car glass sealant, concrete & flooring sealant & textile & leather sealant in Chennai, Tamil Nadu. Pureshield Car glass sealant is a coating material which uses the magic of chemical nanotechnology. Aqueous and oily liquids are simply repelled. Dirt, bugs, ice and other contaminants on windows can be removed faster than they hit your windscreen. With our car glass sealant water, snowflakes quickly run off, so much so that you don’t need windscreen wipers at speeds of approximately 80kmph and above .No scraping of frozen windows is needed. Rain, road dirt and splashes are simply repelled. Tar splashes, oil film, dead bugs and plant resins can be wiped off - even in excessively mucky cases. You will always have a clear view. Easy & quick to apply. Rain water beads and simply run off while driving. Anti Glare, Improved night vision. Reduces adhesion of water and dirt particles. The windscreen wipers become almost redundant at speeds of 80 Kmph. Long lasting upto 1 year or 10000 km. Suitable For: Windscreen, side windows, rear windscreen. cars, 4x4 trucks, van etc. Pureshield Concrete & Flooring Sealant is a dirt and scuff resistant coating material based on nanotechnology. Nano particles result in a longer life for the treated surfaces. Our 'Concrete & Flooring Sealant' provides protection against loam and soil, as well as contaminants due to wet leaves, oil and food. Use it as an invisible and multi functional impregnator for all porous surfaces, such as cement, concrete or house façades. After one treatment, an invisible, dirt-resistant and UV stable coating develops. Surfaces can be cleaned more easily and will be protected for longer against dangerous bacteria, which can cause diseases. Water is enough to clean the coated surfaces. No need to use aggressive and expensive cleaning agents. Pureshield Concrete & Flooring Sealant is free from silicone, wax and oil. The breathability will not be reduced after repeated treatments. It will provide the maximum effect after just one application and can protect the surfaces for up to 10+ years, depending on the use of the surfaces. 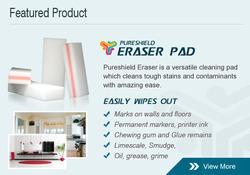 Pureshield Textile & Leather Sealant is a water and oil resistant impregnator for textiles and paper. The product develops an almost invisible film on the surface around the fibres. Through the water resisting effect, the absorbance of water and stains will be reduced. Pureshield Textile & Leather Sealant is dry cleaning resistant. Stone Sealant is an aqueous inorganic-organic coating material that uses nanotechnology. Anti-adhesion components provide a long lasting invisible water resistant and oil resistant film on surfaces. Stone Sealant can be used on absorbent and porous surfaces. Pureshield Rim Sealant is a coating based on nanotechnology. Aqueous and oily liquids are simply repelled. Dirt can easily be removed from car and motorbike wheels and it reduces the adhesion of brake dust. Pureshield Spectacle Sealant is nanotechnology based surface coating material which prevents the accumulation of dirt or dust on your spectacles. Its anti-condensation effect prevents the adhesion of mist on the spectacle surface and thus gives a clear vision all the time. Pureshield Anti-Mist for Glass is a product which gives anti-condensation effect for all glass surfaces. Suitable for coating the inside of automobile windscreen, side and rear windows to substantially reduce the formation of mist and improve visibility especially in cold climate.